In this issue of Puzzler Suguru : Welcome to something special, a real puzzling treat! Suguru is a fresh new logic puzzle like no other. 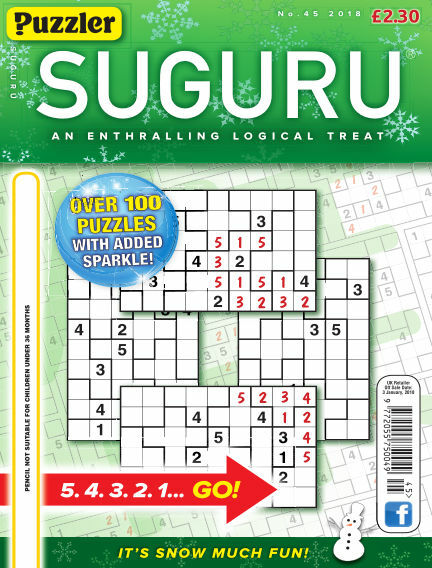 Relatively unknown in the puzzling world, Suguru is a pure logical challenge that is immensely satisfying to solve. Puzzles come in a range of levels of difficulty and can, at their hardest, test the most experienced of solvers. With Readly you can read Puzzler Suguru (issue No.45) and thousands of other magazines on your tablet and smartphone. Get access to all with just one subscription. New releases and back issues – all included.